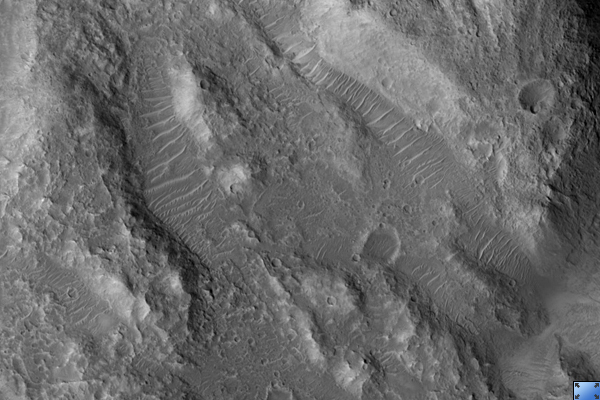 This HiRISE image ( PSP_003538_1885 ) shows a dry cataract within Ares Vallis. A cataract is a large waterfall where there is a high, steep drop. The presence of this large cataract in Ares Vallis confirms that this channel was carved by water, probably in one or many large catastrophic flooding events. This feature has many of the same characteristics as the cataracts on Earth associated with the flood that carved the Channelled Scablands in Washington state, including horseshoe-shaped headcuts and longitudinal grooves. These grooves in the lower portion of the image lead up to the cataract, with the water flowing from the south to the north in this image. It then flowed down the cataract into the smaller incised channel. The horseshoe-shaped headcut here is only part of a larger cataract system, and probably formed during the last stage of flooding. The inner channels are now filled with dunes formed by wind blowing along the channel floor.